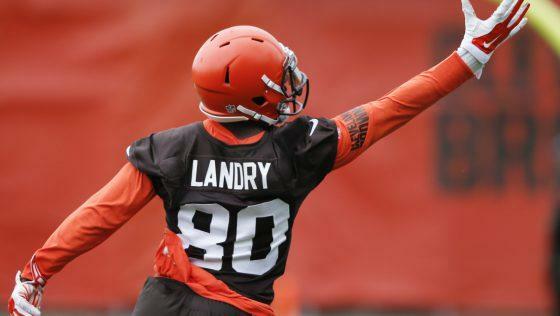 Jarvis Landry Talking Crazy Or Could The Cleveland Browns Win It All? Athletes are known for being a prideful bunch. They tend to think highly of themselves and their teammates. They tend to believe they are the best even when they have been the worst. Usually, they are wrong. But from time to time they end up being right. Will that be the case for Jarvis Landry’s claim about the Cleveland Browns? Landry appears to be heading into the 2018 season with a ton of confidence in his new team. This is a team that has had a never-ending revolving door at quarterback. He’s talking about a team that has won one game in the last two seasons. To go from being a one-win team to winning the Super Bowl would be a pretty big leap. For a team that has been a perennial loser, it sounds like they are taking a step in the right direction. But it is a long way from winning the Super Bowl. Their odds of just making the playoffs are 13/2. As nice as just making the playoffs would be, that isn’t what Landry said they could do this year. He talked Super Bowl. While their odds of winning it all this year are not good, they aren’t the worst either. Their current odds are 80/1 which gives them a 1.23 percent chance of winning the big game. So—with odds like that, Landry must be crazy, right? Not exactly. The 1999 St. Louis Rams had 300-1 odds to win it all with new free agent quarterback Trent Green at the helm. But then he got knocked out with a season-ending knee injury. A then-unknown Kurt Warner took over and—well, the rest is history. Okay, so the Rams got lucky and had everything come together as well as anyone could have imagined. But that doesn’t mean there is a chance that it can happen for the Browns. That is, unless the Browns aren’t as bad as their record makes them appear to be. The defense obviously didn’t slow teams down enough (since they went 0-16), but they were not bad. They only allowed two 100+ yard rushers (Leonard Fournette and Joe Mixon) and only a single 300+ yard passer (Phillip Rivers) last season. With some of the pieces they added in the offseason and the continued maturation of some of their young players, it is not hard to imagine them being better this year. Of course, it will not matter if they can’t score some points. Despite the many positive changes made to the offense, there will be no telling if they can until the regular season starts. Until then, Landry can say whatever he wants because no one can say he’s wrong or right. Does that mean he’s crazy? Of course not. Overconfident? Maybe. But the Browns have a shot to win just like everyone else does– until they prove they don’t deserve it.